Definition at line 93 of file CRDFPredicate.h. Definition at line 99 of file CRDFPredicate.h. Referenced by CRDFPredicate::createAllowedLocationsAbsolute(), and operator<<(). Definition at line 96 of file CRDFPredicate.h. Definition at line 97 of file CRDFPredicate.h. Definition at line 98 of file CRDFPredicate.h. 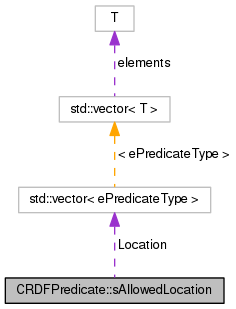 Referenced by CRDFPredicate::createAllowedLocationsAbsolute(), operator<<(), and CRDFNode::setFieldValue().